The text of the declaration specifically includes a statement about the need to implement a raft of reforms related to the World Trade Organization (WTO). In this context, the G20 leaders described international trade and investment as "important engines of growth, productivity, innovation, job creation and development." "We recognize the contribution that the multilateral trading system has made to that end. The system is currently falling short of its objectives and there is room for improvement. We therefore support the necessary reform of the WTO to improve its functioning," they pointed out. The G20 leaders pledged to review progress on the matter at their next summit, scheduled for June 2019 in Japan. They also reiterated their commitment to using "all policy tools" to achieve sustainable economic growth. At the same time, the declaration noted that this growth "has been increasingly less synchronized between countries and some of the key risks, including financial vulnerabilities and geopolitical concerns, have partially materialized." The G20 leaders also signalled their readiness to pursue monetary and tax policies that will support "economic activity and ensure price stability." In addition, they reaffirmed the exchange rate commitments agreed upon by their respective cabinet-level financial authorities and central banking system governors last March, and endorsed the Buenos Aires Action Plan. The G-20 leaders also agreed to work to eliminate the causes of forced migration, which they said remains "a global concern with humanitarian, political, social and economic consequences." "We emphasize the importance of shared actions to address the root causes of displacement and to respond to growing humanitarian needs," they emphasized. 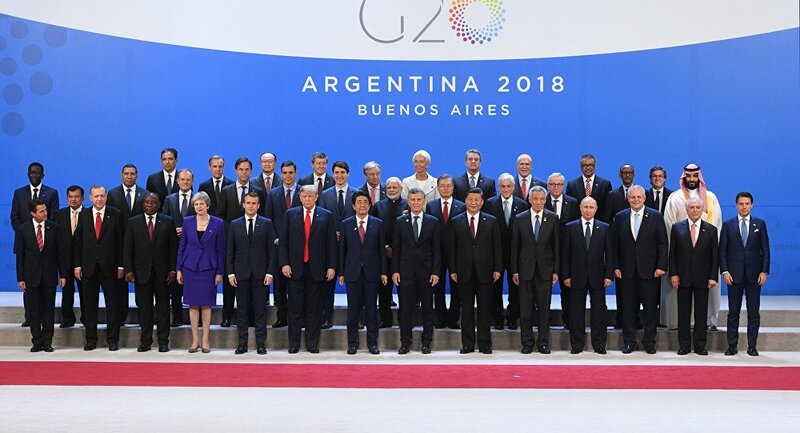 Referring to the 2018 G20 Annual International Migration and Displacement Trends and Policies Report, the G20 leaders pledged to "consider continuing the dialogue on the issue under the next presidency." Another item of the declaration is devoted to the Paris Agreement on climate change. The signatories of the document confirmed that it is irreversible and pledged to ensure its full implementation. In particular, they indicated their intent to continue "to tackle climate change, while promoting sustainable development and economic growth." A separate item of the declaration was related to the United States, which pulled out of the Paris Agreement under the Trump Administration. Washington "reiterates its decision to withdraw from the Paris Agreement, and affirms its strong commitment to economic growth and energy access and security, utilizing all energy sources and technologies, while protecting the environment," the declaration underscored.